It is with much pleasure that we announce the release of patch 1.10.0 for Ryzom. The patch will be applied in the morning of October 18. - Your apartment can now be visited by your friends! Who has not dreamed of organizing a little party in his beloved home on Atys? Inviting others is possible via the WebIG application RyzHome (SHIFT-W in game). - The Web application RyzHome, presented at the Video Festival in Paris, is now available to everyone! You can, using your RPP (RolePlay Points) buy items to decorate your apartment as you wish, to for your own amusement and your friends'. More RPP can be obtained regularly during ingame events organized by the event team. - New variable tokens have been added to the client. The new system will enable you to make chat texts and emotes more dynamic. They are available at any time and in any hunt! $tt$: The target of your target. $tm1$ to $tm8$: Your teammate (from 1 to 8). Example: $t.title$ | Hey, you, over there, the $t.title$! = Hey, you, over there, the Refugee! Example : $tt.race$ | $t$, stop staring at that $tt.race$ ! = Mokoi, stop staring at that Fyros! $<subject>.gs(m/f/n)$: the first part is for a male subject, second for female and the third for neutral. The neutral part is optional. Target is male => Yumeroh says that Jaliun is not his type. Target is female => Yumeroh says that Sengosha is beautiful. Target is neuter (mob) => Yumeroh says that Sprightly Yubo is ugly. All these tokens work whether in an emote, in guild, shout, emote or around chat, and anywhere else. Let's make some macros! - Sorting of contacts and guild lists is now possible. Several methods of sorting are offered and the selected order is saved between sessions. - A 3D preview of items is now shown in the info window. - We have removed the camps observers, and the associated missions as they have outlived their usefulness. The camps themselves remain unchanged. - When you get to the maximum grade 6 in an occupation the experience bar is no longer displayed displayed. - The civilization picks have a new look. - Prices of civilization items have been revised downwards. - The correct message is now displayed when a player with an incompatible allegiance with your guild is invited to join. - The first via "U" Interface/HUD and then check "Show Clock in Compass." - The second via "U" Interface/Chat colors and check "Show Timestamps in Chat" to display a timestamp ([HH:mm:ss]) before all chat messages. Suffice it communicates the password to anyone to whom you want to access. Warning: A player cannot connect to more than 2 channels simultaneously. The new PvP system is based on the fame and not on alignment. To be able to tag for PvP it is necessary to have fame in at least one of the 6 factions (Fyros, Matis, Tryker, Zoraï, or Kami, Karavan) at 25 or above or -25 or below. Who are my allies, who are my enemies? - If you have AT LEAST ONE Fame in opposition (ANTI and PRO or PRO and ANTI) => you're enemies. Example: If you have -30 Fyros, 40 kami and the other player 40 Fyros, 40 kami you are enemies because of the Fyros fame. - If you have ALL your reputation in agreement (ANTI and ANTI or PRO and PRO) => you are allies. - If you have ANY of your fame in agreement or opposition => you can treat him as he does not pvp action. Example: If you have 30 Tryker, 10 Zoraï and he 10 Tryker, -30 Zoraï you are neither allies nor enemies. - A player who is not tagged PvP cannot heal players who are flagged PvP (who have done a PvP action) even if in team or guild. - Attacking another tagged player will flag you. 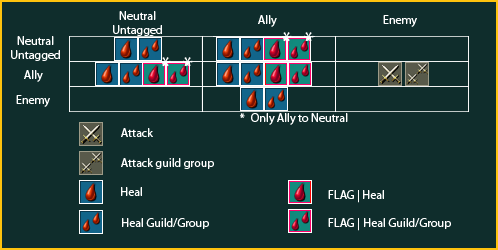 - Healing a flagged player will flag you. 1) Go see the magistrate of Nation X (the NPC that will make you a citizen) while not a citizen (your goal is to lower your reputation by harassing the poor magistrate). 2) Tell him you want to renounce citizenship. 3) The NPC will ask you if you are sure. Answer "Yes". 4) The NPC will tell you when you are not a citizen then he doesn't want to waste his time. 5) Irritated, he will take 1 point of nation fame from you. To lose the reputation of the cult X, the procedure is the same, but you have to go to the temple of the cult. Guild fame will be influenced by the loss of fame as normal. Guild fame does not influence the PvP system at all. With the new PvP system two icons will be displayed above the heads of taged homins. Icons for nation and cult. The icons displayed above a player depend on the relationship between you and the other player. For example, if you are 30 Fyros, 30 Zoraï, another player at -30 Fyros, he will see the Fyros icon above your head. Conversely, a player who has -30 Zoraï fame will see the Zoraï icon above your head. If you have multiple PvP fames, the highest (if positive) or lowest (if negative) will be displayed. For example, if you are 30 Fyros, 35 Zoraï, a player with -30 Fyros, -30 Zoraï will see the Zoraï icon above your head. Kami, Kara : you must be a initiate or follower to gain access. Dude, check your post. vl changed it to point to my post.